We are yakkin’ with the Hockey Hall of Fame‘s “Keeper of the Cup,” Mike Bolt! 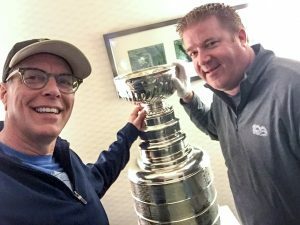 He invited us in to his hotel room during the stadium series game with the Philly Flyers. He shows the typos on the cup. Does he play hockey and, of course, did Phil Bourque REALLY throw the cup in to Mario Lemieux’s pool?? Mike is a super great guy. Thanks to him for giving us some time. Sorry for the unsteady camera work.. but.. when you get a call from Mike to come shoot an interview, you go with whatever ya got! Thanks to 321Blink for the editing and doing their best to make my handiwork look good! YaJagoff Podcast – We Went Wrestling! Pens Win. Win an iTunes Gift Card!